Just mention the show to a guitarist and he or she pictures Don Randall hawking the first truss-rod-less Fender Broadcaster at the Chicago convention in 1950, as distributors of marching-band instruments derided its plank-like body; or Gibson’s Ted McCarty trying to explain the merits of the company’s new humbucking pickup to sales reps at the ’57 show. Or, if they’ve been to a NAMM Show themselves, maybe they’re just hit with a sonic flashback of the brain-buzzing cacophony of product demos that incessantly accompanies your trawling of the display floor. Whatever the name evokes for you – whether you witness it yourself, or read about it afterward in the obligatory Guitar Magazine NAMM report – we guitar fans think of NAMM as ‘our show’, a debutante’s ball for all that is shiny and new in the six-string world. Yet the guitar was barely a player in the instrument market when NAMM was founded, and by any standards, it may still be considered a mere minority portion of what makes up any NAMM Show today. Let’s dig into the origins of this hallowed gearfest and explore the role that our beloved guitar has played in the NAMM Show over the years – and that which the hallowed convention itself has played in delivering the brightest and best guitar innovations to the world. The event that we know of today as the NAMM Show was founded under another name, and it’s important to recognise it was established primarily for the sellers of musical instruments, not for musicians, buyers, or manufacturers – that’s the status it maintains today. As such, from the organisation’s perspective, the big dealers are the stars of the show; for guitarists, though, and other musicians who like to keep up with the industry’s hottest new offerings, the focus has always been on the manufacturers who bring their latest wares to the show to sell to the dealers and distributors who plan their annual buying there. 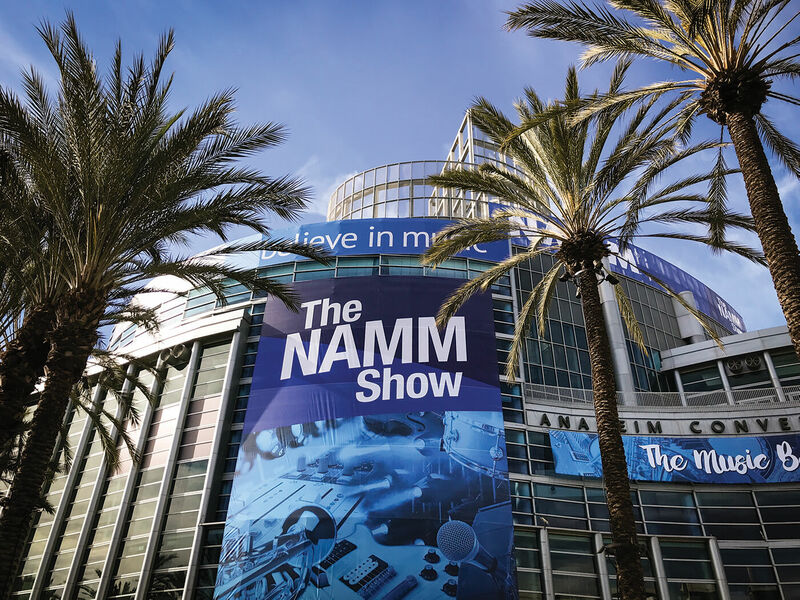 Viewed through the glossy pages of a magazine, it’s easy to misunderstand NAMM’s purpose, and also to miss the point that you can’t just show up, purchase a ticket and walk in to try the offerings. This is resolutely a trade show, and attendance is restricted to owners, suppliers, journalists, employees, endorsed artists, and guests of NAMM member companies. The organisation behind the show was begun as the National Association Of Piano Dealers Of America in 1901 (a time when there were more pianos than bathtubs in the US), when the first trade show was held in New York City. NAPDA’s purpose was to join together and promote legitimate piano makers and sellers in NYC, at a time when many unscrupulous dealers were selling cheap knock-offs as better and more expensive brands. The organisation lobbied heavily in Washington, DC, to establish fair practices in musical-instrument marketing. For a time, according to NAMM historian Dan Del Fiorentino, the annual NAPDA Convention itself mostly roamed the Eastern-third of the US, hitting Baltimore, Maryland, in 1902; Buffalo, New York, in 1903; Cincinnati, Ohio, in 1904, and so on. The show expanded considerably as manufacturers thrived in the 1910s thanks to the popularity of early jazz and the band music of John Philip Sousa, and in 1919, the organisation changed its name to the National Association Of Music Merchants to better represent the entire industry, as many piano merchants were becoming full-line band-instrument dealers. Ah, now we’re getting somewhere. And how many exclusive guitar makers were represented at the 1920 show back in New York City? Zero – by name, anyway. As reported in other histories of the guitar’s slow march toward popularity, the humble six-string was still scrabbling for a foothold in the music world in the 1910s and 20s. At that time, it was largely regarded as a novelty or ‘folk’ instrument at best, struggling to be heard above the more muscular projection of horns, pianos, and even the rather popular banjo. The first appearance of a guitar-maker at the NAMM Show is difficult to trace, because many arrived under the auspices of their distributors or parent companies… that, and the fact that records of attendees are scarce. We can presume that not all of those 10 in the stringed-instrument class were guitar makers, although Gibson would have been represented by the presence of its owner, the massive Chicago Musical Instruments (CMI), and frequent attendee Vega might have been displaying some of its flat-top guitars of the era. 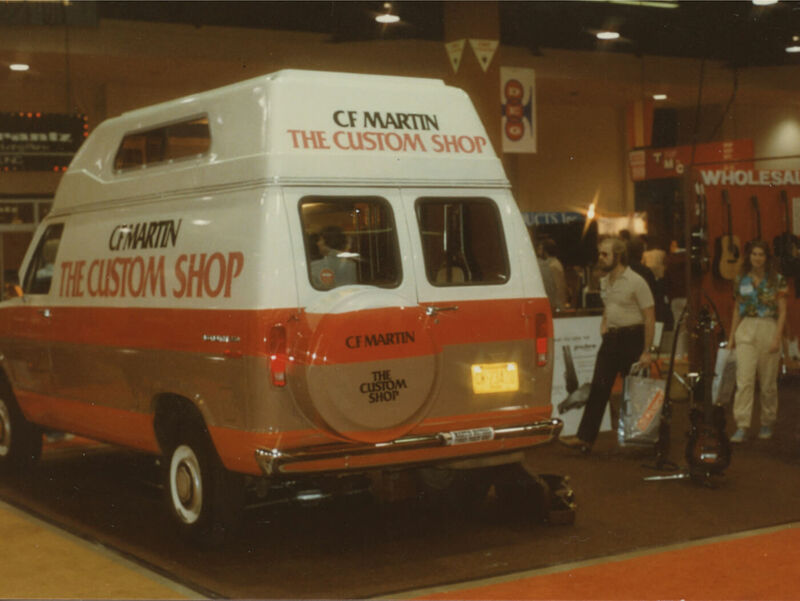 We also know that CF Martin & Co were members of NAMM at least as early as 1934, thanks to a letter retained in the company’s archives (during a brief period when NAMM was in fact NAMMM, for National Association Of Musical Merchandise Manufacturers). 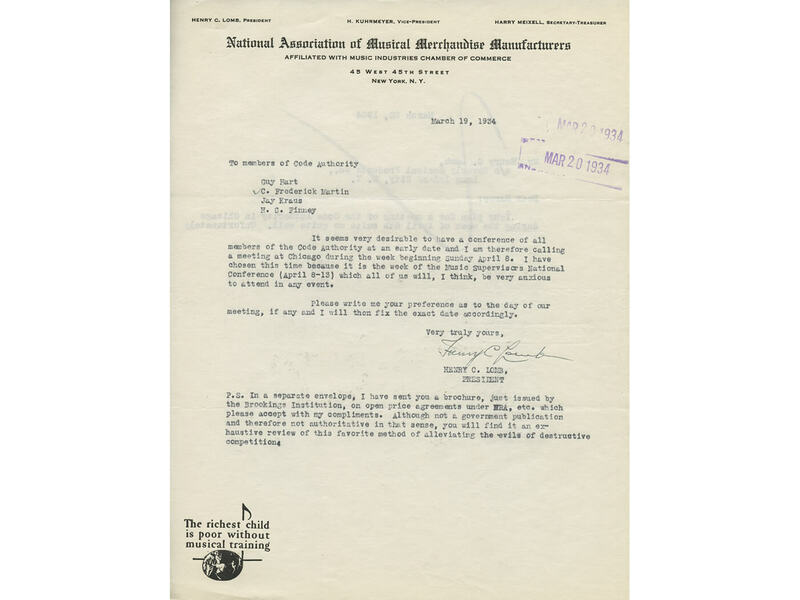 The letter from NAMM(M) president Henry C Lomb is addressed not only to CF Martin III, but also Guy Hart, general manager of Gibson (who, alongside Lloyd Loar, developed many of the company’s most significant instrument lines); Jay Kraus, president of Harmony; and HG Finney of the Oscar Schmidt Company; and proposes a meeting to discuss pricing, although this wasn’t necessarily to be conducted during the convention itself. After WWII, guitar makers’ presence at NAMM clearly increases, as the instrument itself makes greater inroads into popular music. At the 1947 show in Chicago (the show’s most frequent home between 1925-’69), Martin Guitars were clearly in evidence, with CF Martin III at the helm, photographed taking orders himself from prominent store owners. An Exhibitor Listing brochure from the following year – the earliest NAMM was able to provide – indicates guitar presence in the names of CMI (Gibson); the Fred Gretsch Manufacturing Co; Epiphone Inc; the Harmony Co; Kay Musical Instruments; the Vega Co, Valco Manufacturing Co; and to some extent Rowe Industries, which made DeArmond pickups and other guitar-intended accessories. And, although today’s Fender Musical Instruments Corporation tells us: “The earliest Fender that appeared at NAMM was in the early 1950s,” that same list of exhibitors from ’48 includes – down near the end of the Musical instrument Manufacturers category – Radio & Television Equipment Co, aka Radio-Tel, the California-based distributor of Fender amps and steel guitars in the late 40s and early 50s. Thanks to the publication Music Trades, which covered the show throughout the 50s and 60s, we get a look at the displays of some familiar and iconic names of the era. 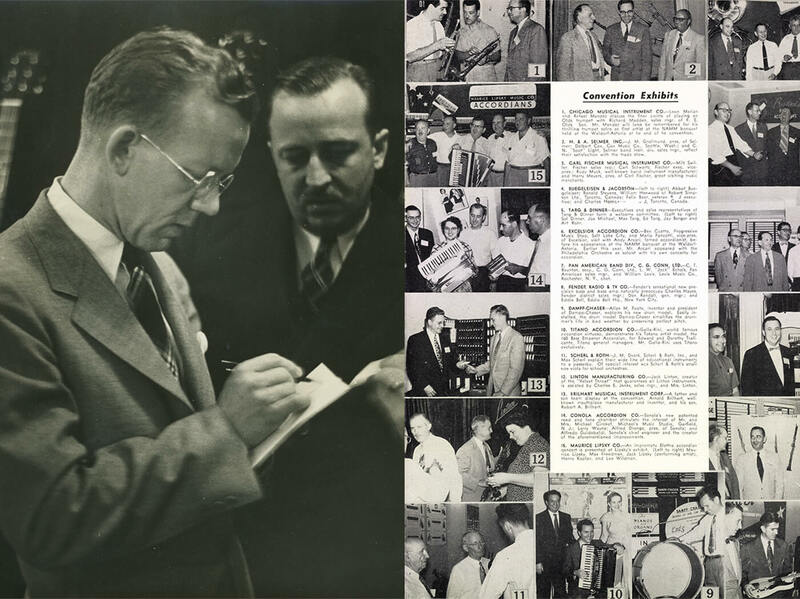 The trade publication’s 1951 NAMM spread shows Louis Dopyera of Valco Mfg Co showing the first tri-cone resonator guitar built under the National name 25 years earlier. The following year, Music Trades’ coverage captures – with even less fanfare, just four lines of copy, and a small photo – one of the most significant ‘firsts’ in the development of the amplified instrument: general manager Don Randall of ‘Fender Radio & TV Co’ proudly displaying the company’s new Precision Bass. The following pages of that year’s spread show Epiphone president AO Stathopoulo displaying some elegant jazz boxes (years before the company had been bought by Gibson parent company CMI); Mario Maccaferri demonstrating his plastic ukuleles to eager Chicago store owners; CF Martin III smiling as a client tests an OM model, and something you won’t see at today’s NAMM Show: the D’Andrea Mfg Co proudly displaying its genuine tortoiseshell picks. The guitar was clearly getting there, and although it was still far outnumbered by accordion (the most populous NAMM entrant of the 50s), piano and organ makers, it finally earned its own category in 1957 – of sorts, at least – under the brochure heading ‘String, Fretted Instruments And Accessories’. In addition to the guitar makers we’ve already noted from previous years, that show witnessed the displays of the Danelectro Corporation, Guild Guitar Co, Magna Electronics Company (makers of Magnatone amps) and two rivals that now appeared under their own brand names: Fender Sales, Inc, and Gibson, Inc.
Today, we most often associate the NAMM Show with a dose of January warmth and sunshine, and palm trees swaying outside the Anaheim Convention Center. The first California NAMM Show took place in 1970, when the trade show became a twice-yearly event, bouncing around initially between Los Angeles and San Francisco before landing semi-permanently in Anaheim in 1976. Called the ‘Western Market’ for several years – while the alternate event was more formally known as the ‘NAMM Convention/Music Expo’ – these have settled into what most know by the simple colloquial references ‘Winter NAMM’ and ‘Summer NAMM’. The latter was a roving event alternately hitting Chicago, Atlanta, Houston, Washington, D.C., New York City, New Orleans, and other destinations until 1993, when it found a semi-permanent home in Nashville (although Indianapolis, Indiana, and Austin, Texas have since been visited). Even in the classic-rock-saturated days of the early 70s, organs made up a full quarter of the entire industry represented at the NAMM Show. With the electronics revolution of the late 1970s and 80s, the show itself expanded considerably, too. The guitar industry was racing to keep up with the keyboard and synthesiser boom, both in an effort to combat the ever-new-and-shiny of that brave new world of sound and by rolling out its own new wave of effects pedals and rack units. According to NAMM historians, the last major boom for the guitar itself (for now) was likely the one experienced in the early 90s, when grunge made rock cool again in the hands of bands such as Nirvana, Soundgarden, Pearl Jam and others of the Seattle wave. By this time, British makers had figured heavily in the show, too, with Marshall and Vox establishing a presence that outshone even that of the latter’s British Invasion status of the 60s, and a revitalised Orange and Laney soon joining them in the hallowed aisles of the show. Marshall’s unveiling of the scorching Silver Jubilee amp line at the ’87 NAMM show marked the company’s celebration of its 25th anniversary; just one of many major NAMM moments for British amp makers over the years. Post-boom, the guitar continues to be central to many of the industry’s most exciting new developments, even if it doesn’t define popular music in quite the same way as it did in the 60s and 70s. Digital amp-emulation technology gripped the show in the late 90s, with a virtual phalanx of red, bean-shaped POD units on demo podiums making the Line 6 booth one of the most-visited displays of the 1999 Winter NAMM. In more recent years, the continuing explosion of digital gear and app-driven accessories has been paralleled by a seemingly paradoxical proliferation of ‘boutique’ guitar and amp makers, which now represent the high-end of the industry. If the category encompasses only a fraction of the market in terms of sales numbers, in the eyes of many players, it tends to present the epitome of the craft and often garners the most interest regarding the art of the guitar and the state of luthiery today. With this in mind, for the 2019 Winter NAMM Show, the cream of the crop will feature in The Boutique Guitar Showcase, a curated collection of some of the world’s most innovative luthiery centrally located within the NAMM Campus, rather than cordoned off in the ancillary hall to which smaller makers had often been relegated in years past. And what will be the next major product breakout unveiled in the NAMM Show aisles? Get a heads up on all news, rumours and previews at our NAMM hub page.